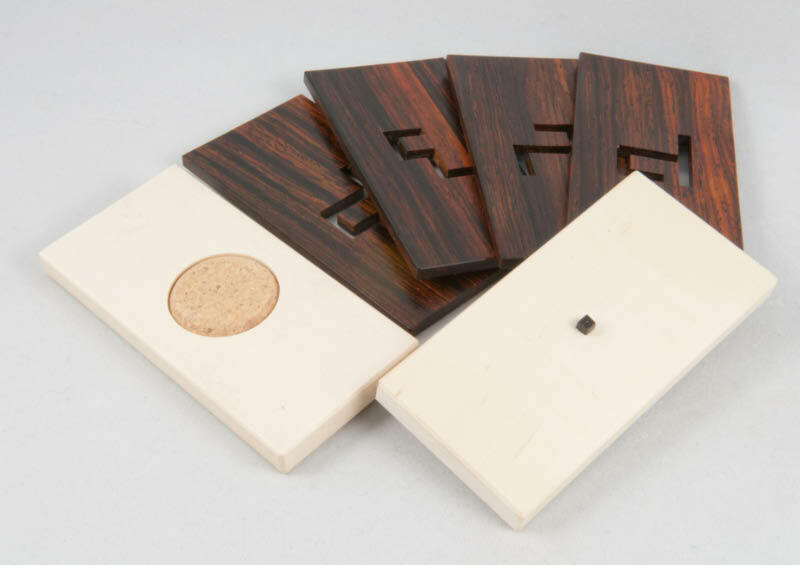 One of the web-sites I enjoy looking through from time to time is Kagen Scheafer’s – and a while go he said he’d be making another round of his rather well-received Maze Burrs (the one that won the IPP Puzzle Design Competition in 2006) – this time around in Cocobolo, Ebony and Holly wood. 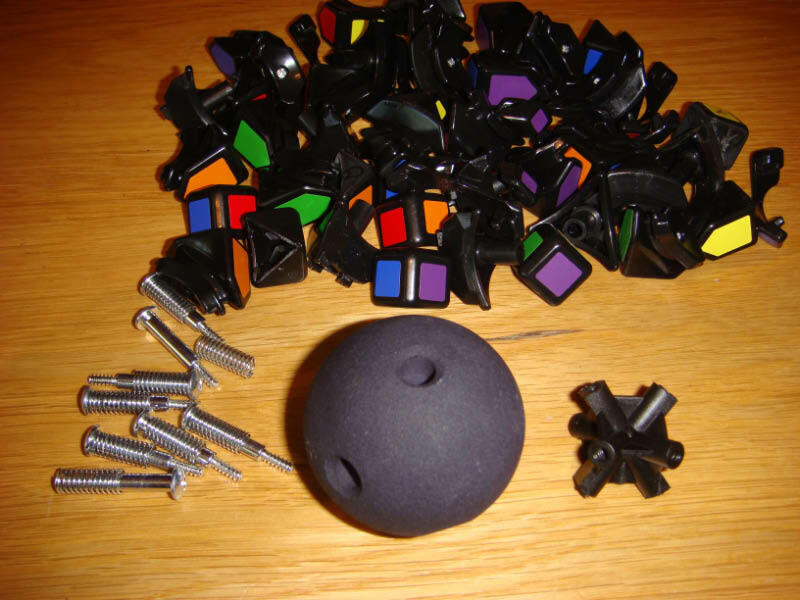 Within a day or two my puzzle-mate Nigel had pulled a group of us together for a bulk order from Kagen and took care of all the arrangements. A few weeks later Kagen let us know that the puzzles were on their way and they duly arrived at Nigel’s place. The timing was a bit unfortunate and all our carefully laid plans of getting together for a grand ritual joint opening (unveiling, as opposed to solving – some of us are a bit slower than the others!) of the puzzles got blown to heck because Nigel was about to go away for the weekend and I was about to disappear on a 2 week cruise – but I did manage to play with it a bit and take some pics before I got on the boat, so here are some thoughts and some pics to show off Kagen’s incredible handiwork. 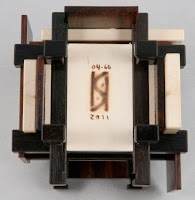 The Maze Burr is basically a cube with a pair of wooden plates on each face: a Holly plate with a square Ebony pin and a Cocobolo plate with a maze cut into it – the sets of plates engage into an Ebony framework that allows the two plates to move at 90 degrees to one another (maze / pin plate permitting, of course). The edges also interfere with one another depending on how they are positioned. The way the internal frame is designed, there’s space in there for an extra six maze plates ... two of the maze plates have an extra channel cut in them to allow the plate to be slid all the way on or off - depending on which maze plates are used, and how they’re oriented relative to one another, you can either give yourself a pretty simple challenge, or a really tough challenge. It’s all in the details – I’ve already mentioned that the maze pins are square – and in fact all of the mazes are cut with square corners – now I’m no craftsman, but I suspect that that little detail added significantly to the complexity of making up these guys. On the back of the Holly plates, Kagen’s added a cork pad so that the back of the Holly plates don’t scrape against the Maze plates not currently in use ... and at the same time provide the right amount of pressure to keep the maze pin properly engaged ... it’s all in the details – very nice work. Kagen provides a booklet with each puzzle that not only gives a brief history of the puzzle but also a number of suggested constructions along with their solutions courtesy of John Rausch. I’m not sure if he’s done this with all of the puzzles in this batch, but mine arrived well and truly locked up in a configuration that requires 89 moves to solve. Nice guy, Kagen! I’ve been meaning to pick up one of these little guys for a while now. I first saw them in wood in Grand Illusions (where it’s known as Trisected Cube) and I’d seen a metal Bits and Pieces version on the net, but when one of Wil Strijbos’ regular newsletters said he had some for sale I dived in straight away. 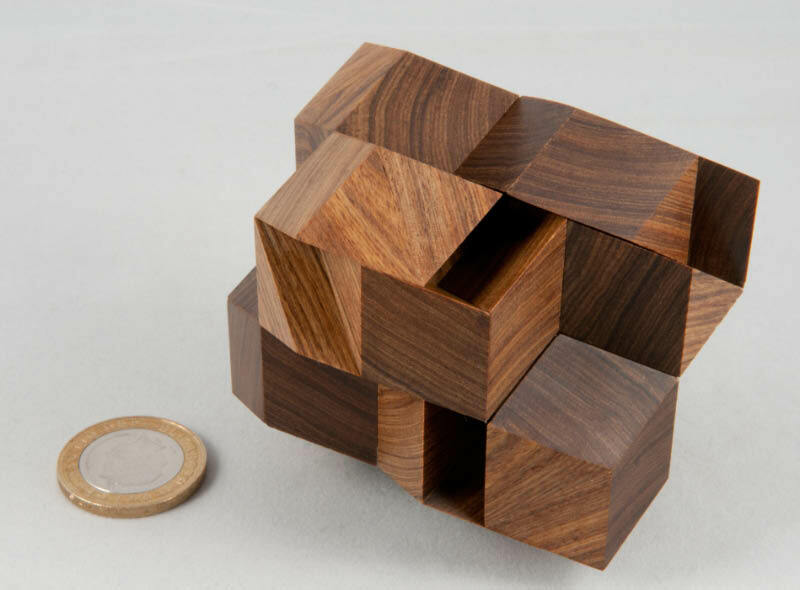 It’s pretty straight-forward as a puzzle – three similar interlocking pieces intertwined to form a cube – but the charm is all in the way that it does that. It’s a simple, pure coordinated motion puzzle – as you unfold the three pieces at the same time, the cube expands to the point where the pieces separate. 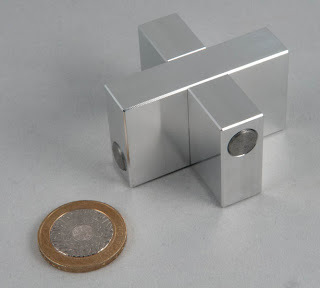 Each piece interlocks with the other two in a beautifully complicated way. 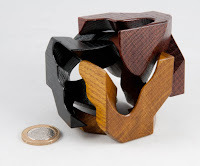 The edges join up and mate together in interesting patterns that seem to have only one purpose – to entertain. It’s neatly made and looks great. ...which I stupidly hadn’t asked for the first time around, and having heard Chris enthuse about it, decided I should rectify that this time. Scott made this Fusion Confusion in a combination of the woods I had in my Rosebud and Super Nova – so they look great as a set. Fusion Confusion is Stewart Coffin’s design #15A and for a puzzle that consists of a paltry four pieces, two of which are identical, it’s incredibly ‘interesting’. 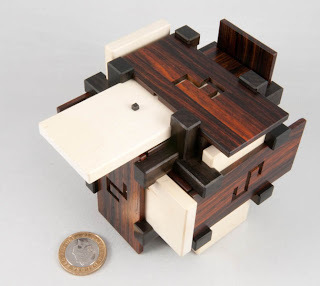 Starting from the assembled puzzle, your first step is to slide the two halves apart to get two sub-assemblies, but the combination of Mr Coffin’s crafty design and Mr Peterson’s delicate craftsmanship make that an exercise in experimentation – every time. There are simply no clues as to which axis to explore (and this isn’t a big clue, but it slides apart at an unexpected – for me anyway! – angle). So I still find myself hunting and prodding different bits until I find the right one. It’s a tremendous design that can be assembled a number of different ways – each with a totally different external shape, no internal voids, and again, no clues to which axis to start the disassembly from – I know I’m new to Stewart Coffin’s designs and I’m playing catch-up with the rest of the puzzling world, but I’m really enjoying discovering Coffin’s designs through Scott’s handiwork. 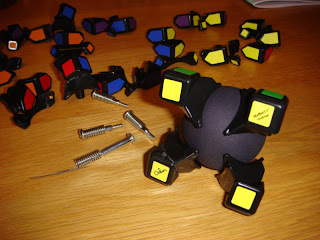 The main reason for the order was to get a pair of Cluster Busters: an Original CB and a Cluster Plus – I suspect that any collection needs at least one ... from what I’ve read, the name Cluster Buster relates to the grip required to open the puzzle (it’s unusual to say the least and requires a bit of dexterity and a lot of either experimentation or wildly sideways thinking!) 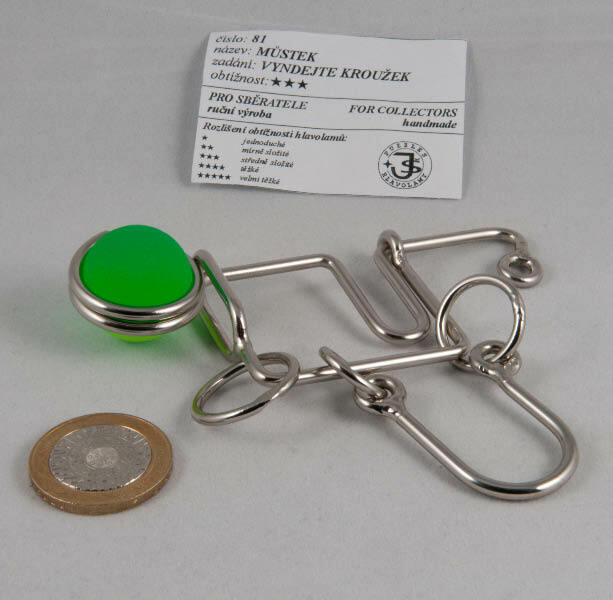 and the Cluster Plus, while looking ostensibly the same as the Cluster Buster when assembled, uses differently shaped pieces deliberately to catch out someone who’s mastered the Cluster Buster – can you tell why I ordered this particular pair of puzzles? (Yeah, I’m a sod!). OK, so both of these puzzles looks like two layers of three rhombic dodecahedrons, one layer resting on top of the another. I got one with the two layers in different woods and the other in a single wood (Tambotie, if you’re interested and don’t recognise it – a happy coincidental link back to my South African roots courtesy of Scott’s collection of hard woods). 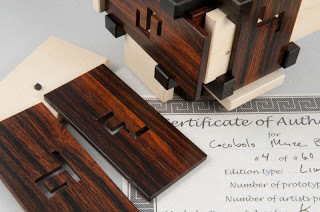 As usual Scott’s workmanship is absolutely mind-blowing – the joins between pieces are pretty hard to spot, and when combined with Master Coffin’s designs that generally have you pulling the puzzle together tighter and tighter, these are excellent puzzles to confuse folks with. 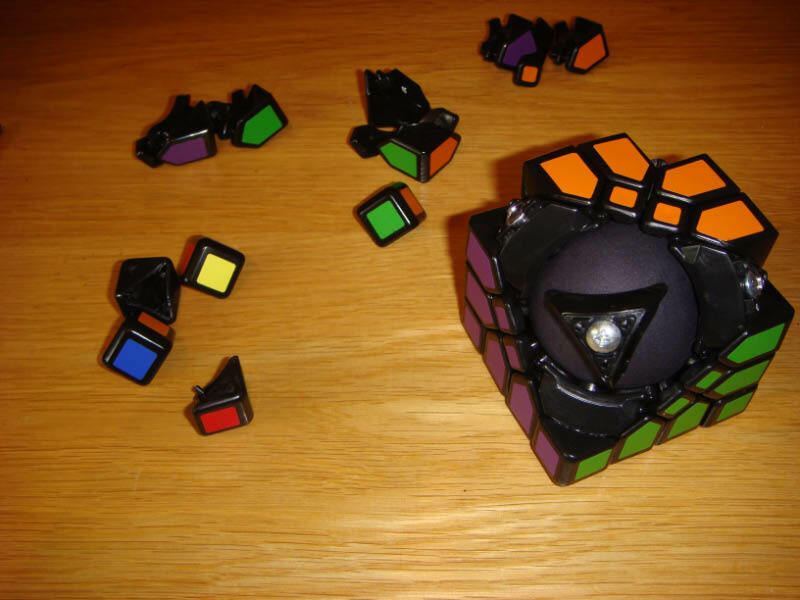 The two puzzles may look similar when they’re assembled, but they really are totally different for me – the Original Cluster Buster is a real sod to get the first separation going, but from there on out it’s pretty straight-forward, with each sub-assembly falling into three pieces once you’ve pulled them apart ... and when reversing the process, exactly the same thing is true again – getting the two sub-assemblies together is almost trivial, but joining them is incredibly tricky – every piece as to be absolutely smack-on or they won’t go together ... in fact Scott’s tolerances here are so fine that I found the only way to really get all pieces properly aligned in the two sub-assemblies was to cheat and tape them together using masking tape – having done that they slide together beautifully – and everything is then solidly held in place while you remove the masking tape – don’t think of trying to close it all up with the tape still in there, the tolerances won’t allow it. As I’ve already said once or twice, the Cluster Plus may well look the same as the Cluster Buster on the outside, but it’s a different beast altogether ... something that Master Coffin seems to be fond of doing ... I think I’m going to get to like this man. Again, it is however a tale of two halves – find the right places to apply pressure and pull the two halves apart – and that’s actually a bit simpler on the Cluster Plus than on the original – however at this point, the two sub-assemblies don’t automatically disassemble – and getting them apart takes a bit of a knack, and may I suggest, a little co-ordinated movement. Reassembly again has you scratching your head trying to work out how the heck to get the three pieces together into a single unit that you know have to go together ... you’ll notice that some of the internal apexes have been flattened a bit, and that’s one of the keys to getting things back together again ... the other is probably patience. 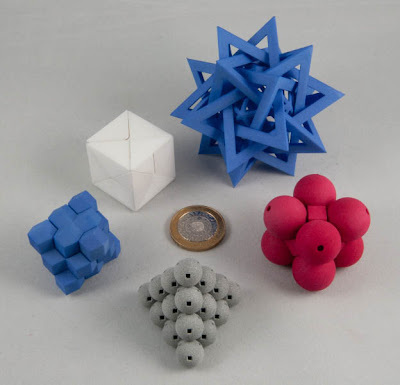 All in all, great puzzles, superbly made ... thanks Scott. Half full, or half empty? Nope, Always Empty! 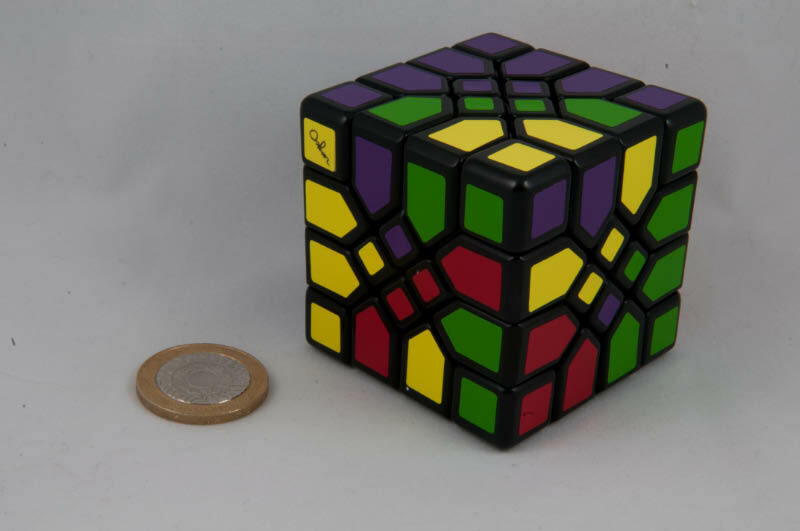 Like all the other guys, I bought mine off Puzzle Paradise on a Buy Out offer after seeing one of them offered on the Australian Relief Puzzle Auction. Phil’s done a really nice job of packaging up his puzzle boxes and I’m certain that opening the lid on the packaging to find a “Care and Feeding” booklet has put a smile on the face of many a hardened puzzler! 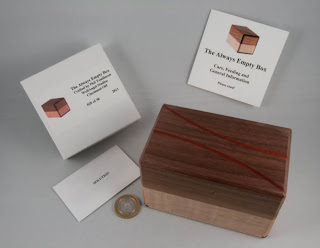 The Always Empty Box is a nice size, and the finishing is top-notch – the inlaid arcs on the top of the box make a beautiful feature and show off some of Phil’s clearly well-honed skills. 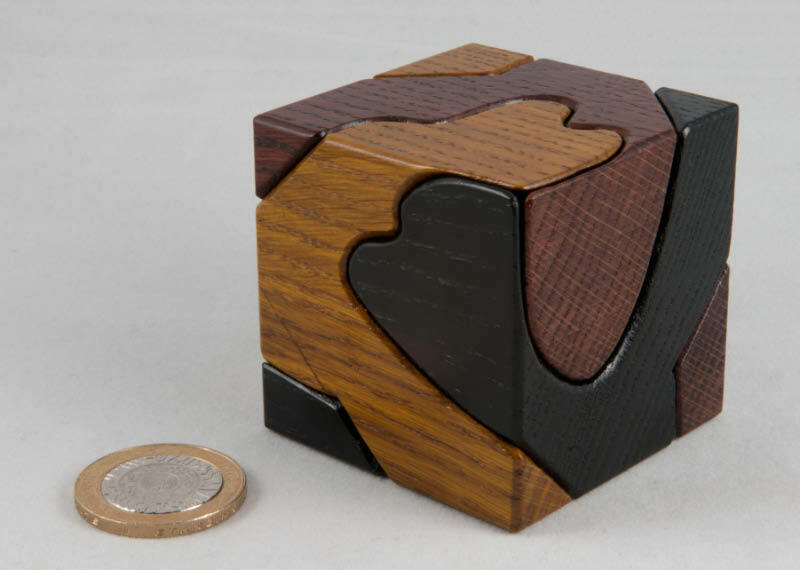 As a puzzle, I was expecting something reasonably straight-forward given the description on the auction site, where it was billed as a 3 move puzzle-box ... starting to play with it, the first move almost made itself, with one panel being fairly loose ... but from there progress slowed for a little while – the next obvious move isn’t – you’re going to focus on trying to move something that won’t ... I like it when puzzles send you in the wrong direction like that! A bit more exploring leads you to the second move that is a lovely little surprise – now that I know it’s there I can spot the signs, but I’ll be darned if I could see them before that... (which is a bit of a compliment to Phil, I suspect) ...it reminds me a bit of one of my favourite burrs (work that one out!). From there the box has one last little secret – not so much a move as a ‘reveal’ – it’s cute. Right, so what do we think? 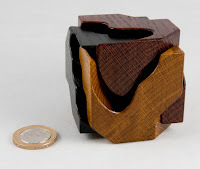 ... and we hope that we can encourage Phil Tomlinson to do more of the same in the future – as a first puzzle box it’s excellent – I really hope he’ll be sufficiently encouraged to go on and develop more of them – cheers Phil! 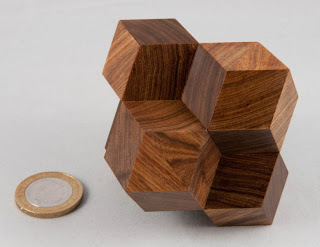 When Wil Strijbos told me he had included an extra puzzle in my last order and he was interested in my thoughts on it, I was intrigued and my curiosity piqued more than a little. He mentioned it was a collector’s wire puzzle from Jan Sturm and I have to admit to being a little less curious at that point – and I know that makes me sound like either a spoilt brat or a jerk, but I’ve never been all that attracted to wire puzzles. All the ones I’d come across up to now were more or less variations on a theme (bent nails or oddly-shaped loops apparently intertwined) so I‘d modulated my hopes down a few degrees by the time the package arrived. Turns out I shouldn’t have – this was no ordinary wire puzzle made of bent bits of wire in strange shapes – this was almost a little bit of art. 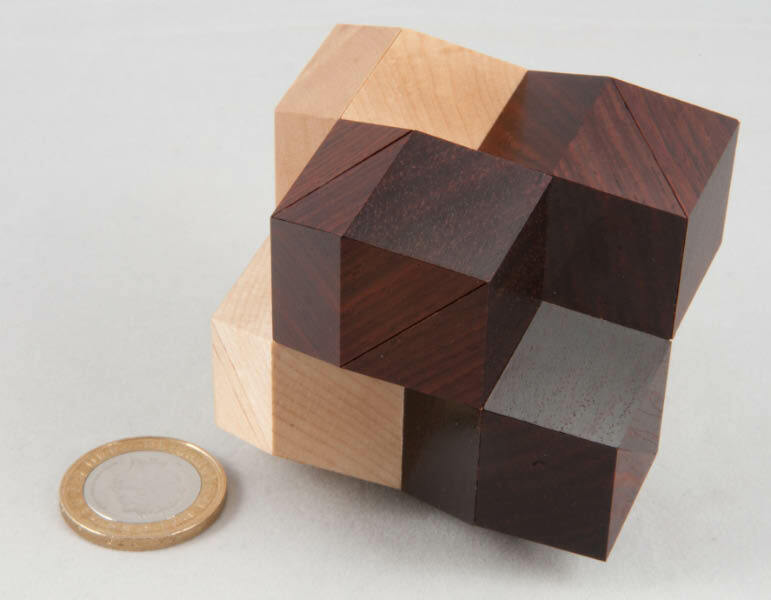 Yes, mechanically it resembles a couple of similar puzzles I've come across, but the presentation is quite different. 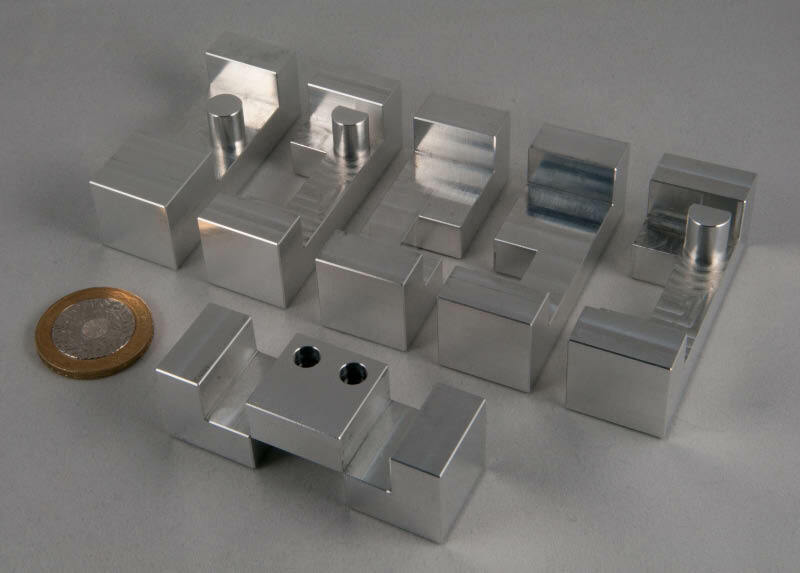 The finish on each piece is meticulous – the ends are all soldered and carefully finished and smoothed off or rounded. He’s captured a rubber ball in the end of the centre-piece to form a rather useful handle and add a neat little bit of colour into the puzzle – he didn’t have to do that ... the other end of the centre-piece has a small ring welded to it, giving it a neat, nicely finished appearance and stops anything from snagging on the end of the piece. 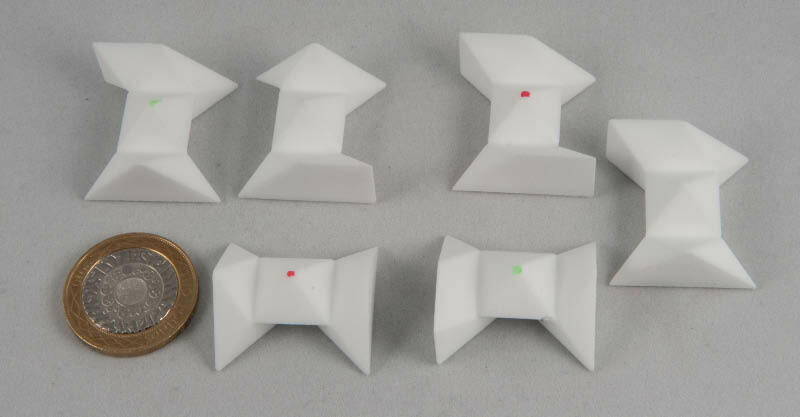 A quick look at the pictures shows that you have a central piece with a horseshoe hanging off it. There’s a ring threaded on that horseshoe, trapped behind another horseshoe device attached to the first one – get the ring off (and replace). Simple? Judging by the packaging, this is part of a set from Jan Sturm (it looks like this one might be called Mystic and be #81 in a series of puzzles) and I’m certain that if you’re interested, Wil will be more than pleased to tell you more about them and what’s available in the series. 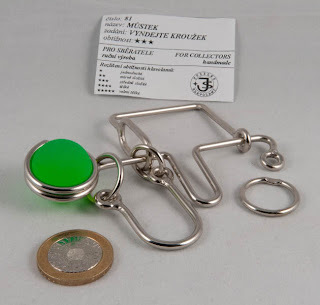 Thanks Wil – it’s helped to remove a preconception I had about wire puzzles. Wil Strijbos is a Dutch puzzle designer and supplier of note. 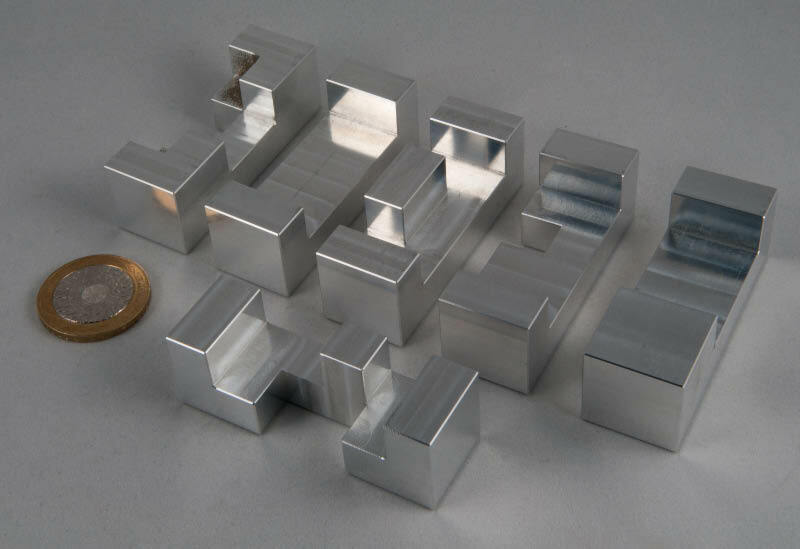 His puzzles have followed a number of notable themes in the past – I’m quite new to all this stuff, but even I’ve noticed a series of bolt puzzles, a series of cola bottle puzzles and a couple of scotch bottle puzzles, but the one that I like most of all, is that he’s produced an eclectic bunch of puzzles in aluminium. They look great, last forever and you can safely pass them out to all comers – regardless of how careful they are with your puzzles! 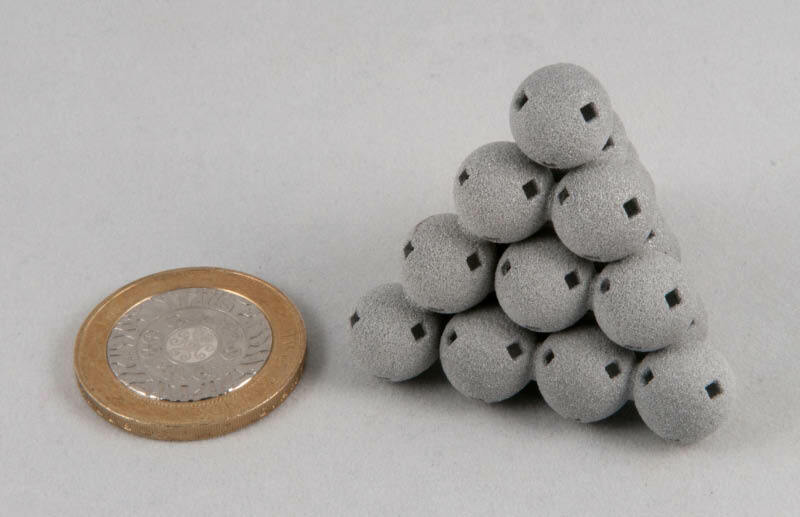 Next up, one of Wil’s regular emails announced the availability of a couple of six-piece burrs in aluminium. 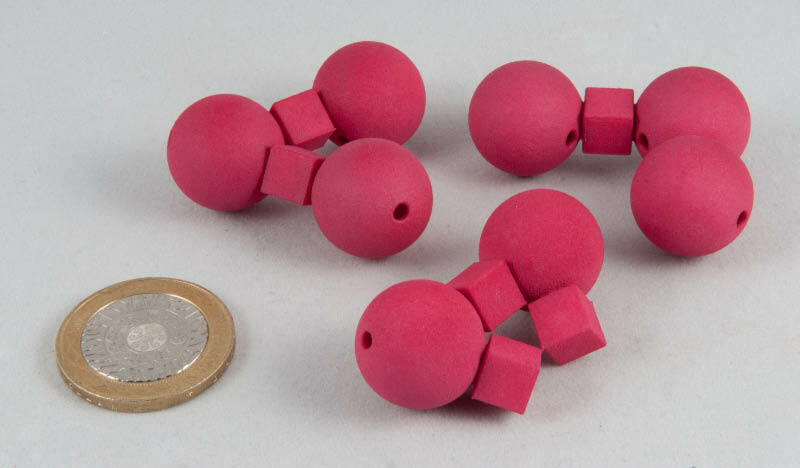 They were advertised as a pair of 7-move and 10-move burrs, without mentioning the actual designs. I missed out on the first manufacturing run, but managed to secure a pair from the second run. Saying they’re solid is a pretty large understatement! 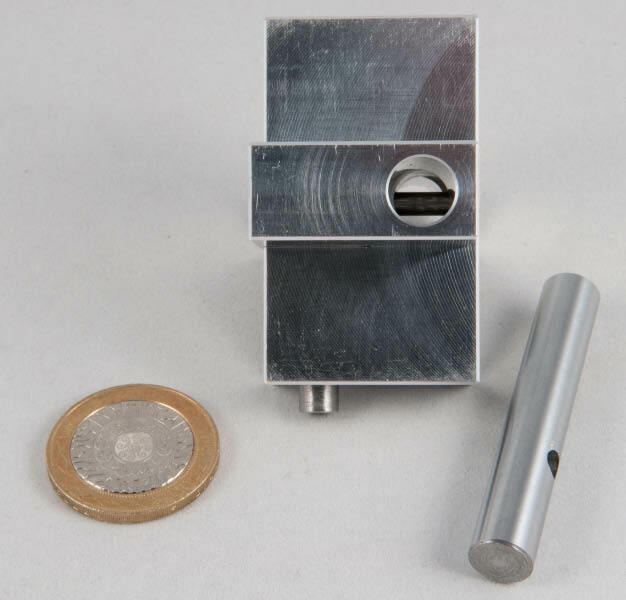 The fit is simply tremendous and any fears you might have of a loose burr that you could shake apart are instantly banished when you pick these up. At the start, there is simply no wiggle or give on any of the pieces, except the one(s) that should move – and the movement is smooth and precise. 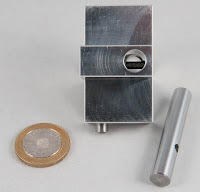 Wil’s aluminium version of Peter Marineau’s Piston Burr is great – while technically a level 9.3 burr, it was designed by Peter in 1986, by hand, and at the time it was the highest level 6-piece burr with a unique solution known to man! Wil’s Cross is a really brilliant puzzle – there are a couple of tricky bits where things sometimes work and sometimes don’t – and working out how to get past them is quite tricky. Wil being Wil, there are dead ends and red herrings along the way ... realising this was the first puzzle he ever designed, he was clearly going to go on to great things, and has ... Thanks for taking us back in time Wil. 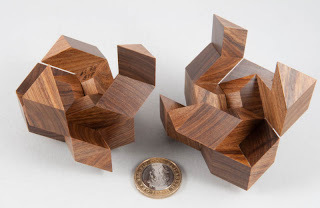 On my recent little foray into Shapeways-world I also picked up a couple of George Bell’s puzzles (again, it would have been rude not to...). 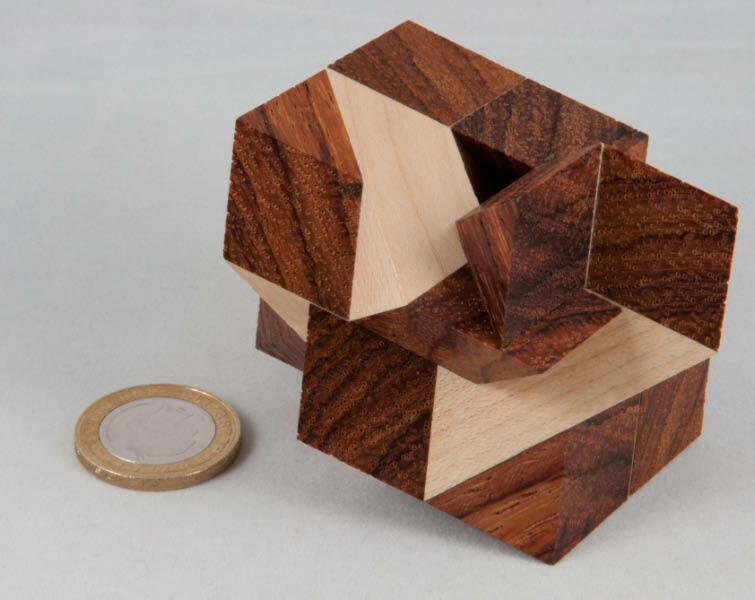 Diagonal CubePuzzle: this was Stewart Coffin’s design # 58, first released in 1981. 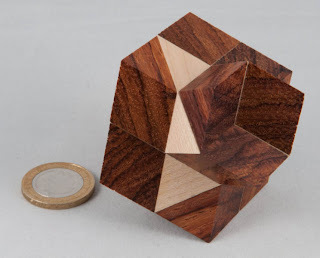 While most copies of this puzzle are made in wood (and cost a lot more than this version), George published this one on Shapeways in October last year and for the princely sum of $26.50 you get a classic little puzzle with a whole lotta pedigree. 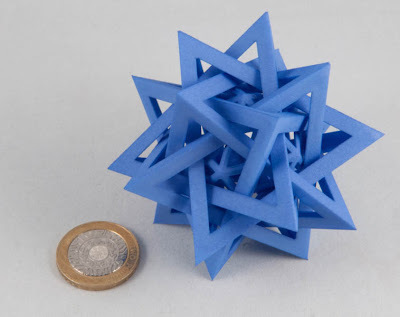 It’s hard enough trying to figure out where to place the dissimilar pieces to create a solid cube, but then you need to work out how to actually assemble them in a co-ordinated motion along the right axis. The pieces are nice and solid and interlock neatly – great little puzzle. Stan’s Tetrahedron (invented by Leonard Gordon in 1988) is a very interesting assembly of a tetrahedron using two mirrored pairs of identical pieces. The unusual angles used in the pieces, and interesting shapes of the pieces themselves make this an interesting little challenge... with the last piece locking the assembly together rather neatly. Octahedron with child consists of 4 pieces – 3 of which are similar and rather unusual in their shape, whilst the fourth is a tetrahedron made of 4 rhombic dodecahedrons that serves as a locking piece to keep the assembly together. 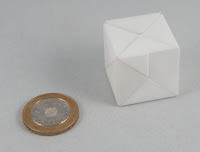 While I’m ready to admit that I’m no expert on these sort of puzzles, I find the angles in working with rhombic dodecahedrons rather confusing and more than a little challenging – but finding the right way to get the first three pieces to make the guts of the octahedron ready to accept the child-piece makes for good, rewarding puzzling. 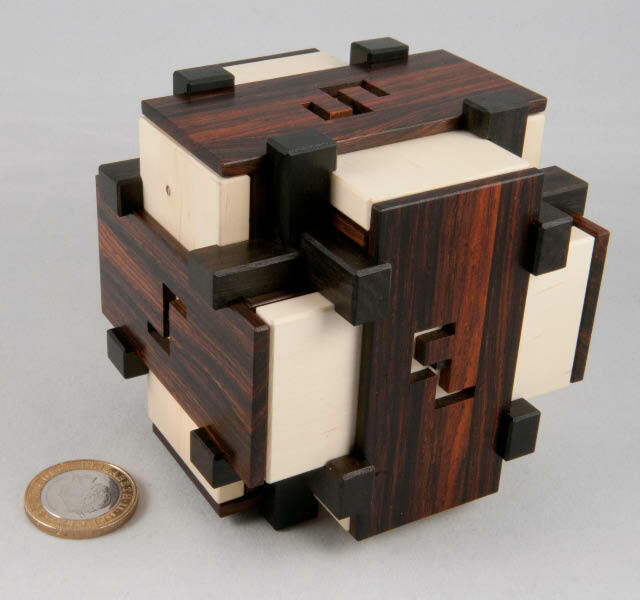 Kuball Puzzle was designed by Viktor Genel and modified a little by Tom Lensch, who added the cubes between the balls when he made the puzzle in wood. This is the simplest of the puzzles I got from George’s shop, but again the angles and the interlocking of the pieces makes for a satisfying little puzzle ... very cute. OK, so in the last post I mentioned that I’d picked up one of Oskar’s new centre-pieces from Shapeways for my Mosaic Cube, and that I’d ordered a couple of other things while I was there ... well, it would have been rude not to, wouldn’t it? Oskar’s Shapeways shop has an absolute abundance of specialised puzzles for the discerning twisty-guru – right up to a DIY 17 * 17 * 17 twisty cube – if you simply have to have the biggest, badest cube in town! He also has a number of other puzzles, including a series of Cooksey Mazes that caught my eye. 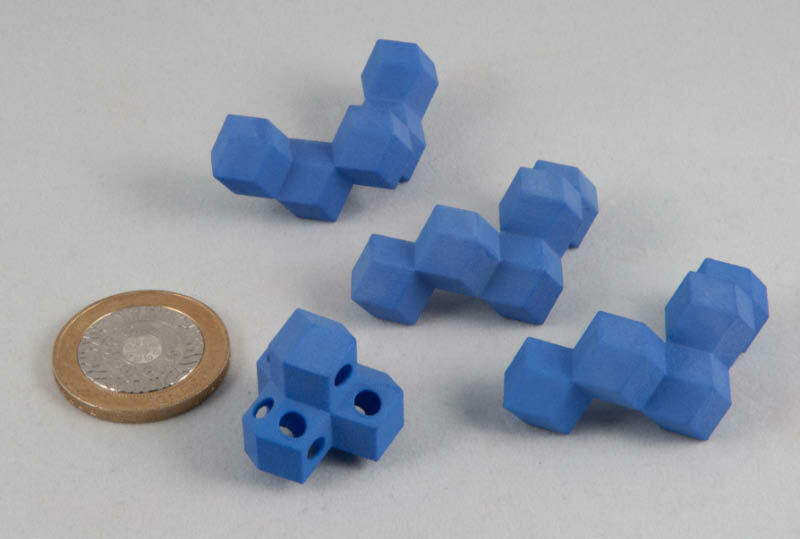 The original was designed in the 1970’s as a prototype Pentangle puzzle that didn’t quite get off the ground – Oskar has simplified the design in a reproduction of the original Cooksey Maze and then produced a set of 6 Cooksey Tributes for Shapeways to churn out. 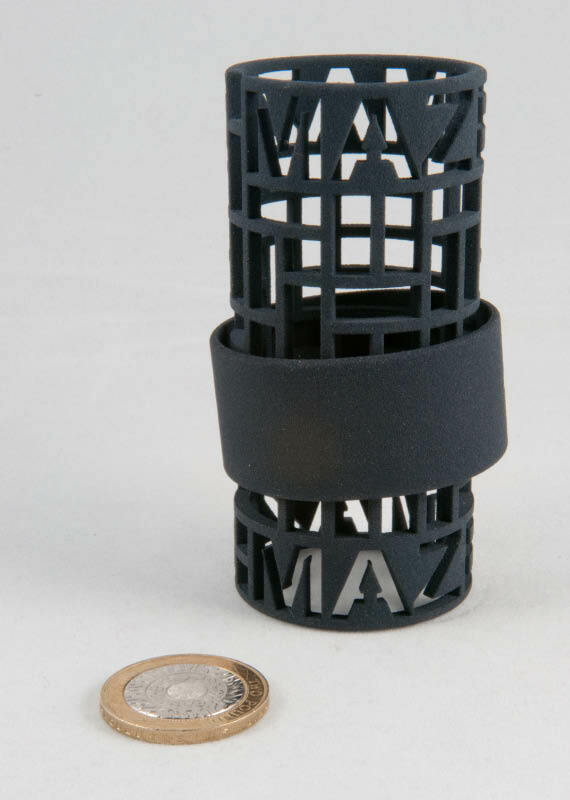 I picked up a copy of the ‘original’ Cooksey and it’s a neat little puzzle – the ring has two pins that alternately engage opposite sides of the maze on the cylinder. The ring is a bit oversize, so at any time, one pin is engaged in the maze and the other is free allowing the ring to either rotate or slide up and down, depending on the orientation of the hole that the pin’s engaged in. 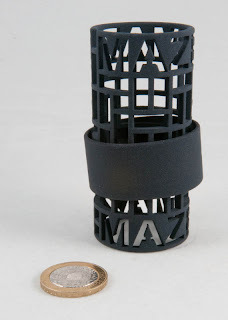 The maze itself is made up of a series of 2*1 or 3*1 rectangles orientated horizontally or vertically and the aim is to work your way from the start of the maze at one end of the cylinder to the other end (and back, since you can only take the ring off on one end). 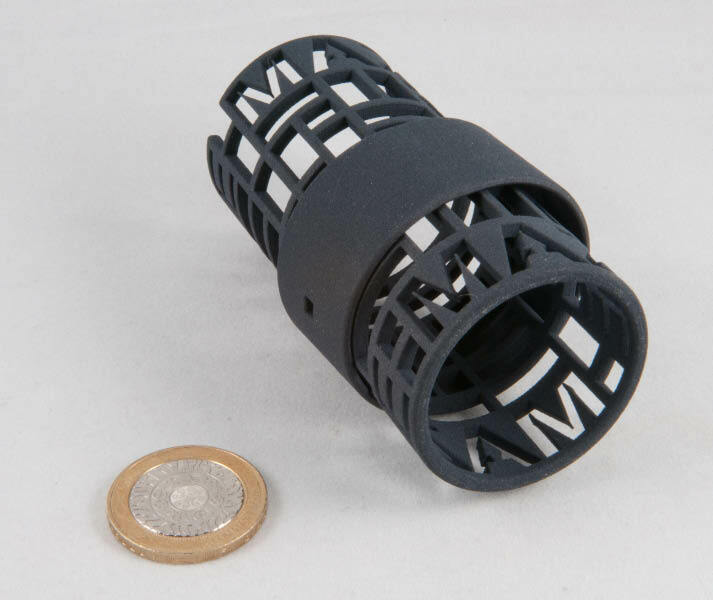 Working between the two pins you can rotate the ring and move it up and down following the rectangular holes in the cylinder – every now and then you’ll come across a single square hole, which effectively means you’ve hit a dead end and need to retrace your steps a bit. The framework construction of the cylinder can make for a slightly disorientating experience and the interaction between two sets of opposing holes makes for an interesting puzzle. No doubt if you take the trouble to map out all the possible routes, it collapses into a fairly simple puzzle, but that’s probably true of a lot of puzzles. A couple of weeks ago I splurged a bit (I know, dear reader, you’re struggling to imagine that, but bear with me!) on some twisty puzzles from Kayleb’s Corner – there were quite a few twisties listed so I took the opportunity to add a couple of unusual twisty puzzles to my rather limited collection (I hadn’t really been a huge fan of twisty puzzles). 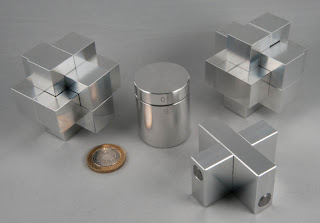 One of them was a Mosaic cube designed by Oskar van Deventer (yip, him again!) and produced by Mefferts. 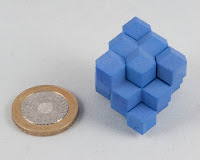 It’s a corner turning cube with an interesting design that creates pretty patterns when you play with it (Yes, I’m very shallow!) 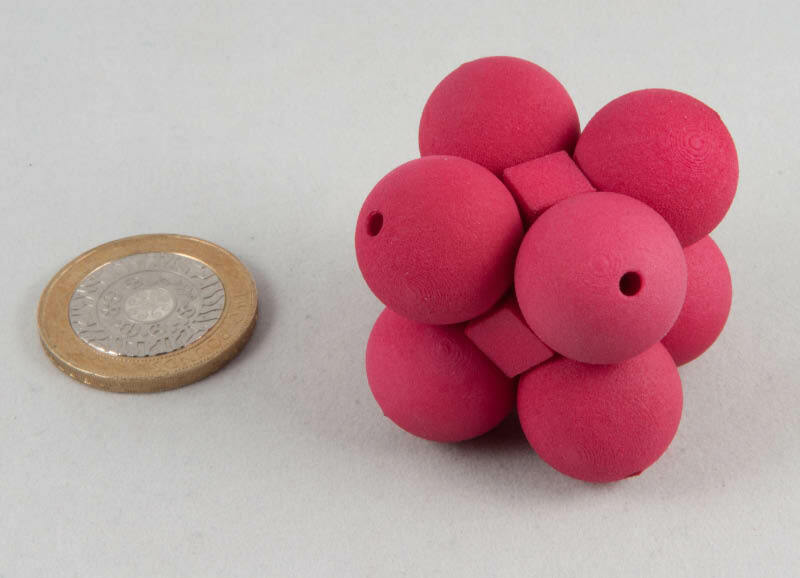 While it looked great, playing with it left you with the distinct feeling that it was about to disintegrate in your hands – which isn’t so great. 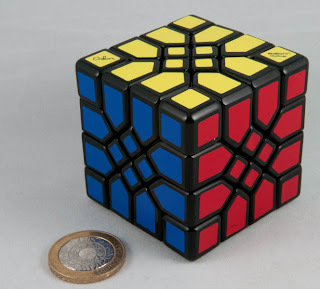 Turns out this is reasonably well-known and documented out there in internet-land: it stems from the design of the central frame that leaves quite a lot of space free inside the cube, so pieces can slide and shift a bit more than they should in the wrong places. Knowing I was going to have some time to rebuild it on Saturday morning, I started taking the cube apart on Friday evening – the hardest part is popping off the caps on the corner pieces – in the end I realised the easiest way was to prise them off bit-by-bit from each of their three corners using a flat bladed screwdriver ... most of them popped off fairly easily, some were real sods to lever off without stabbing yourself with a screwdriver (once too many in answer to your next question!). 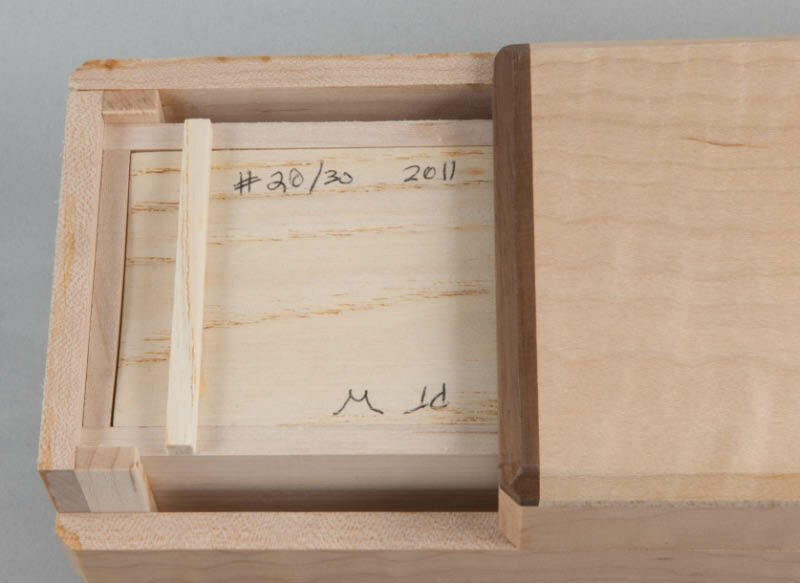 The corner caps are aligned with three little pegs mating into three holes on the corner pieces. Some of those pegs will break off during this process – but the caps need to be glued on anyway, so don’t worry if that happens. Once the corner caps are popped off, a Philips screwdriver will unscrew the corner pieces and the puzzle effectively disassembles itself. Screwing the corners into the new centre is a piece of cake and everything fits absolutely perfectly. 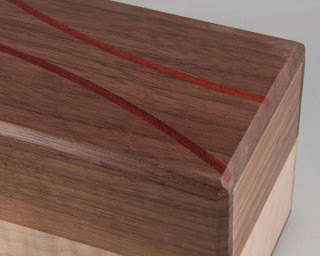 Once the corners are screwed in, you can assemble edge and centre pieces (I found it helpful to sort them into the right layout and then work from one face to the next, building up one edge at a time). The only slightly tricky bit in the assembly process is inserting the last edge piece, but I found that unscrewing the final corner allowed enough play to squeeze in the last edge piece without the rest of them falling out... from there you need to adjust the tension on the corners to taste and pop the corner caps back on again with a little glue. End result – a Mosaic cube that looks as good as new, but works a lot better! Thanks to Rob for writing this up and telling us about it – it’s transformed my Mosaic cube from a display-only piece into a nice working puzzle. If you have an unmodified one lying around, get the new centre and rebuild it – you won’t regret it!